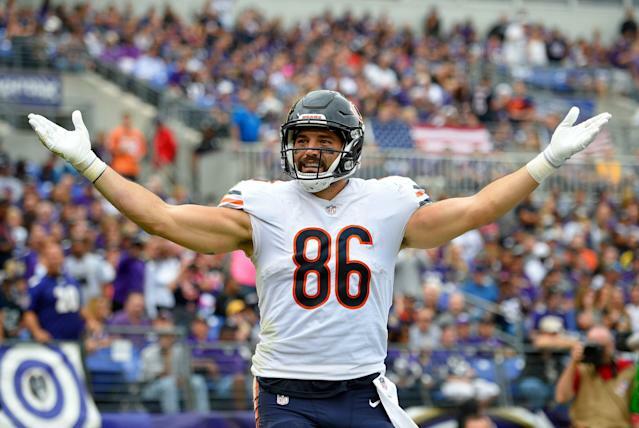 Give Zach Miller credit for trying to make it back from one ofthe worst leg injuries the NFL has seen in recent years. Miller, in the middle of a late-career breakout with the Chicago Bears in 2017, injured his leg trying to haul in a touchdown against the New Orleans Saints. The injury was so bad, he almost lost his leg. Miller tried to make it back, but called it a career on Tuesday. In an Instagram post, Miller said he was retiring from the NFL. Miller’s story could have been a lot worse. He needed urgent vascular surgery on his dislocated knee to repair artery damage days after the injury. Still, it’s a reminder of how cruel the NFL can be. Miller had a nondescript career early on, and didn’t even play in a regular-season game from 2012-14. Then he resurfaced with the Bears and in 33 games between 2015-17 he had 1,161 yards and 11 touchdowns. He got a two-year, $5.5 million contract in 2016, at age 32. It’s the kind of late-career emergence we don’t see often. Then, it ended suddenly. Miller’s last NFL play was memorable for how graphic the injury was, and that replays were shown repeatedly because officials had to determine if he caught a touchdown. His touchdown was overturned on review, though that was far from the most important thing in the moment. In a class move, the Bears signed him to one-year deals each of the past two years, even though the odds of him playing again were not good. Miller was lauded for doing what he could last season, helping out his fellow tight ends and everyone else. It wouldn’t be a shock if he laid the groundwork for a job within the Bears organization. Miller’s career is officially done. He’s a reminder of how fragile all NFL careers can be.